Pollution caused by chemicals from the petroleum industry, toxic human waste, overfishing and spillage from oil tankers are threatening two-thirds of the Gulf region's coral reefs and its marine life, according to an environmental researcher. Abdul Nabi Al-Ghadban, a researcher at the Kuwait Institute for Scientific Research, said recently there were dangerously high levels of petroleum hydrocarbons in the sea. Al-Ghadban said that the Gulf region has 8 percent of the world’s coral reefs but two-thirds have been classified as endangered by environmental organizations. Pollution has increasingly affected marine life because of land reclamation and oil dredging, he said. He said there are three times more petroleum hydrocarbons in the Gulf than in the North Sea and double the levels in the Caribbean. This has affected the coral reefs and mangrove forests, he said. Other sources of pollution are untreated sewage being pumped into the sea from the city’s sewers and heat pollution caused by electricity and desalination plants. 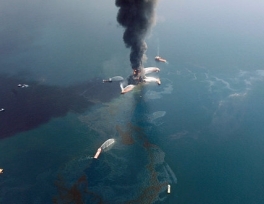 “Oil spills from oil tankers and the wars in the Arabian Gulf such as the Kuwait invasion in the 1990s has had a negative impact on marine life and the ecology of the Gulf,” he said. The many instances of dead fish floating up on Gulf beaches were a direct result of oil and other forms of pollution, he said. “There are no high levels of minerals such as mercury, lead, nickel, cadmium and copper in the region, but some hot spots have been created next to chemical plants because of waste disposal and water desalination. This has created an unhealthy environment for marine life and may lead to their extinction,” he said. Al-Ghadban said the first Gulf war resulted in the explosion of the Al-Nairouz oil well in Iranian waters in 1979, which spilled more than 2 million barrels of oil into the sea. The war to free Kuwait in 1991 spilled more than 12 million barrels of oil, in addition to residues from burning crude oil wells. “The war on Iraq in 2003 caused enormous oil spills and the sinking of war ships. 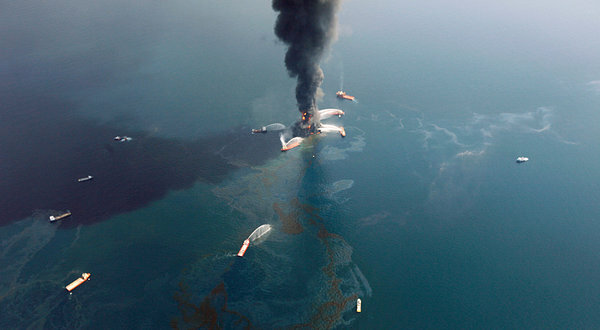 More than 1.2 million barrels a year were wasted during marine operations related to transporting crude oil,” he said. He said the Arabian Gulf was one of the world's most congested marine transport routes. More than 25,000 ships loaded with 60 percent of the world's oil exports crosses the Strait of Hurmoz annually, creating a dangerous environment for marine life.